Today I thought I’d try a different-for-me meme, and join the Friday Face-Off meme, created by Books by Proxy, with weekly topics hosted by Lynn’s Book Blog. The idea is to put up different covers for one book, and select a favorite. 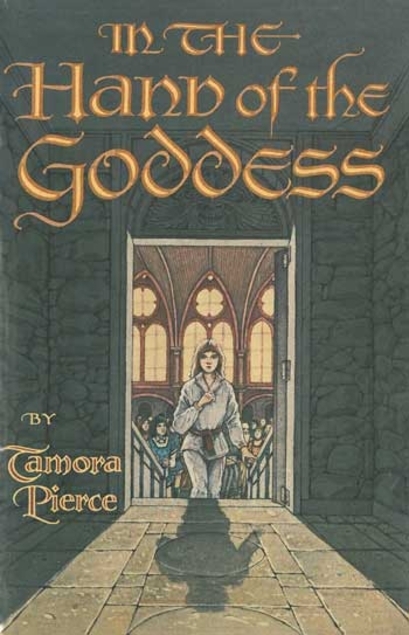 One of my favorite bookish heroes is, of course, Alanna the Lioness in Tamora Pierce’s wonderful book series. 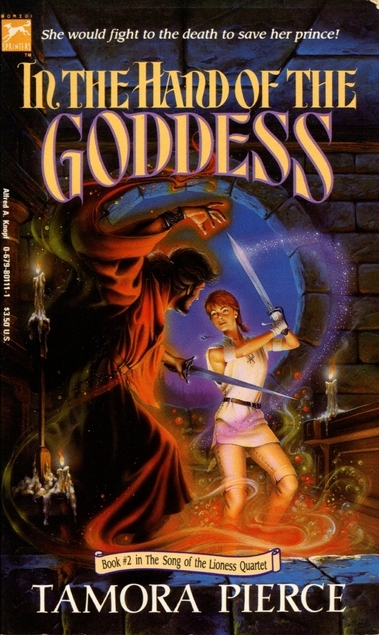 I thought I’d highlight the second book in the series, In the Hand of the Goddess, because I’m fascinated by how cover illustrators handle the issue of a female hero disguised as a boy. The answer is…not very well! 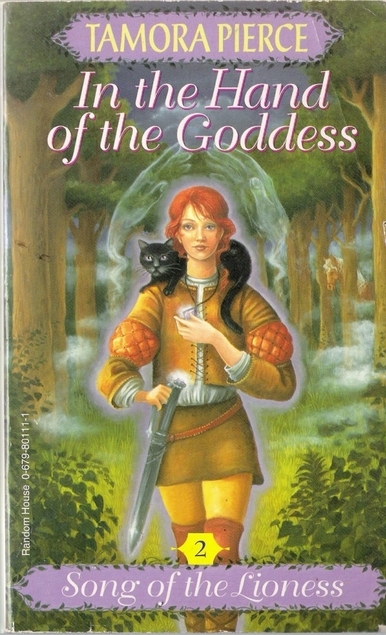 We start here with this rather awful cover, which clearly did not even try to depict Alanna’s disguise. It’s an action sequence and her hair is the right color, which is about all I can say for it. This cover graced the library copy I read the very first time I encountered this book, so I have a nostalgic fondness for it. I like the drama of the moment and the framing of Alanna, as well as the nice detail in the setting. She at least isn’t showing much figure, but that hair isn’t helping the disguise. 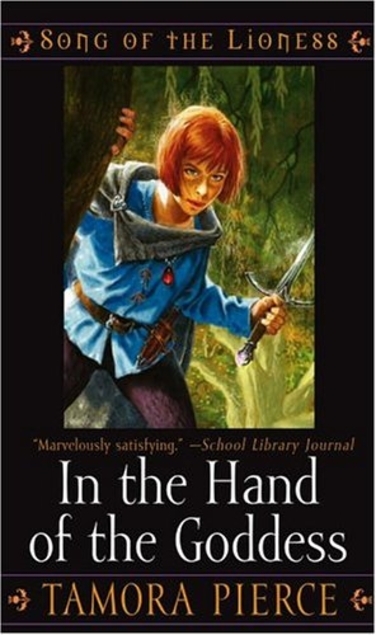 This cover wins for the most convincingly androgynous protagonist–she actually could be a girl disguised as a boy, and neither the disguise or the true gender seem impossible. I like the clothing choice and the sword hilt too. It’s just too bad she has such a glowery expression! By contrast this one has a great expression, resolute and defiant, and I like the hair style. I want to love this cover, probably for the expression alone. If she was just standing a little less model-like, with a little less figure…well, then I could more easily forgive it for not only getting the color of her magic glow wrong, but also the color of her horse wrong. And is it really safe to hold a sword like that? This is the cover on my copy, and I like the detail of it a lot. 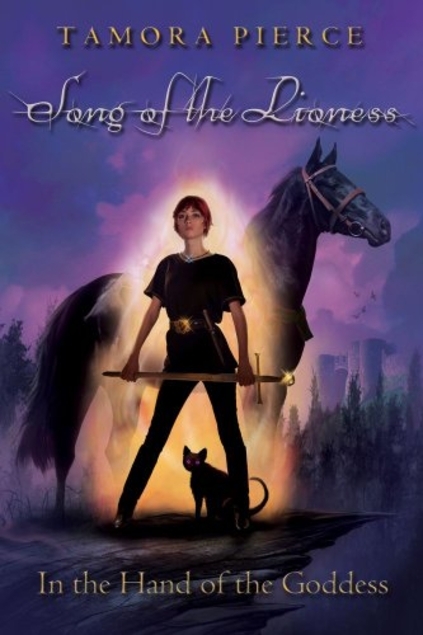 Someone actually read the book because there’s a lot of elements in play correctly here: the purple glow for the magic, the horse in the background, the jewel on the sword hilt and the necklace. Points for putting Faithful on her shoulders too, and the ghostly Goddess hands look protective and evoke the title nicely. If she just looked a little more boyish (and what’s with the tunic/miniskirt?) this would be the break-away favorite. Instead, I’m calling it a tie with this next one. 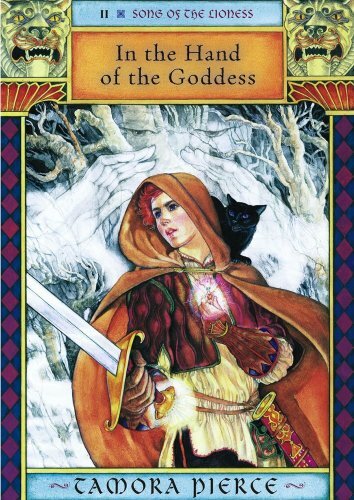 This is just a little bit busy–but I’m liking all the detail in her clothing, we get Faithful, the magic necklace, and the Goddess hands, plus a convincing job done on that disguised-as-a-boy aspect–which obviously is a stumbling point often! Cover comparison really is pretty fascinating 🙂 Especially with a book as difficult to depict as this! What a great post. I know what you mean about covers getting it entirely wrong. I like the one you have (second last). In some ways she looks more boyish than most, but mainly because she’s costumed like a traditional pantomime hero (traditionally played by a girl). That would work for a lot of cultures, I think. The fourth is awful, even to someone who doesn’t read the books! What amazes me is that you found so many different covers for the same book. I can’t think of any book I’ve read where I’ve seen more than one or two covers. This one certainly inspired many different illustrators, for better or worse! Sadly, right or wrong, I feel like I can pick out some covers definitely done by men. As for others – Who grips their sword blade like that? Yikes! I think the last one has the clothes better, but the perspective is a bit wonky.